On New Year’s Day 2019, NASA’s New Horizons spacecraft will zoom past MU69—a mysterious Kuiper Belt object located four billion miles from Earth. In anticipation of the upcoming flyby, NASA has just revealed the probe’s flight plan, and there’s some exciting news: New Horizons is expected to come three times closer to MU69 than it did to Pluto in 2015. 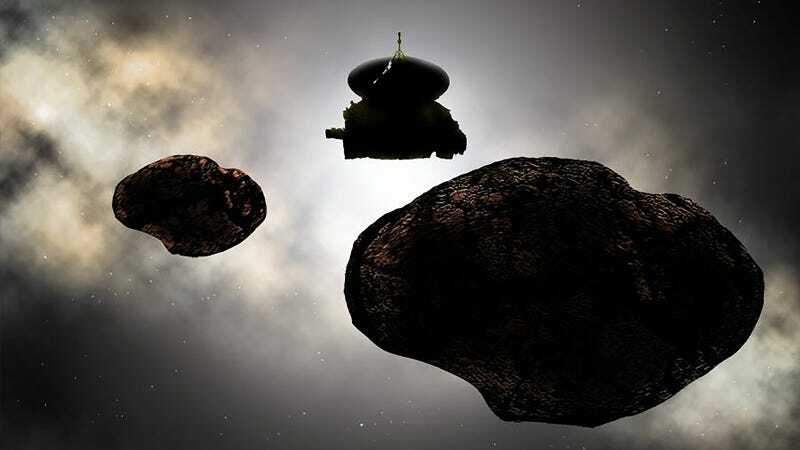 When New Horizons gets to MU69, it’ll be the furthest Solar System encounter ever made by a space probe. To add a cherry on top of this very delicious ice cream sundae, New Horizons will come within 2,175 miles (3,500 km) of the distant Kuiper Belt object at closest approach. At that distance, the probe’s telescopic Long Range Reconnaissance Imager (LORRI) will spot details as small as 230 feet (70 meters) across. By comparison, the resolution at Pluto, with the probe zipping past at a distance of 7,800 miles (12,500 km), was around 600 feet (183 meters). At least, that’s the plan for now. Should the NASA scientists detect debris around MU69, the probe’s course will be altered such that it doesn’t come any closer than 6,000 miles (10,000 km). If all goes well, that science should include geological, compositional, and other information, such as whether or not MU69 hosts an atmosphere or small moons. We currently know very little about this object, but preliminary observations suggest it has a reddish hue, and that it’s irregularly shaped. In fact, MU69 may actually be a pair of objects strung closely together by their mutual gravity. The giant chunk of rock, or rocks, is no more than 20 miles (30 km) in length, and it’s very elongated. It’s quite possible that MU69 is a two-lobed object similar to comet 67P/Churyumov-Gerasimenko, which was observed by the Rosetta spacecraft from 2015 to 2016.